International press reports stated that a well blowout in the Zunil geothermal field triggered a landslide that killed  people. Later investigation determined that the landslide [was more likely caused by failure of the steep slopes above the well than by a "blowout"]. The following report is intended to clarify events and document the deposits. A landslide occurred at approximately 2230 on 5 January at Zunil geothermal field (figure 19) (2.5 km WSW of Zunil, on the E flank of Santa María volcano; Santiaguito is on the SW flank of Santa María), damaging either the wellhead or the surface casing (or both) of well ZCQ-4. The landslide scarp was above the well pad, and it was unclear if the damaged geothermal well played a role in causing the landslide. The landslide lobes flowed ESE about 1 km from above the well site, destroying . . . 6-8 houses on the level terrace area below, and blocking the road between Quetzaltenango and Retalhuleu. Seventeen bodies had been recovered by 10 January, but other reports indicated that 33 people had been killed. Rescue workers continued to search for buried survivors on 7 January. The site of a proposed 15-megawatt geothermal power plant and an older well (ZCQ-1) were covered with slide debris. Well ZCQ-4 was blowing uncontrolled, and the Instituto Nacional de Electrificación (INDE) was [exploring ways to shut-in the well, which was buried by slide debris]. Another well, ZD-1, was being drilled when the landslide occurred, and the crew was evacuated safely. Figure 1. Sketch map showing well ZCQ-4 in the Zunil geothermal field and deposits of the 5 January landslide. Contour interval, 100 m. From the Colomba and Santa Catarina Ixtahuacán quadrangles (nos. 1860 II and 1960 III). 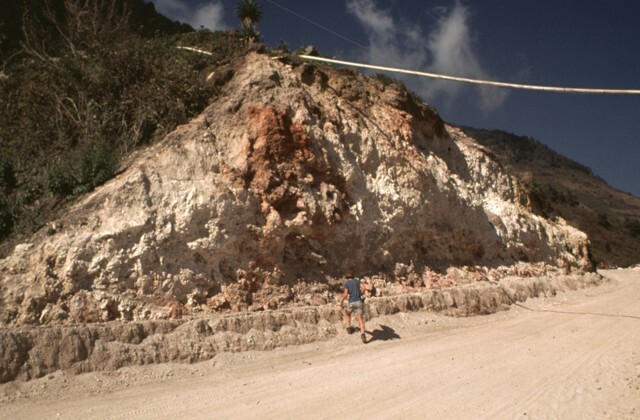 The landslide was composed of four overlapping lobes, the lowest of which was mostly kaolinite and fine-grained altered volcanic materials; a large area of intensely argillically altered rocks had existed above the wellsite before geothermal development began in the 1970's. The three subsequent landslide lobes were smaller, and appeared to be wetter but less highly fluidized than the first. The first deposit was sufficiently fluidized that people sank to 10 cm depth when walking across its surface. 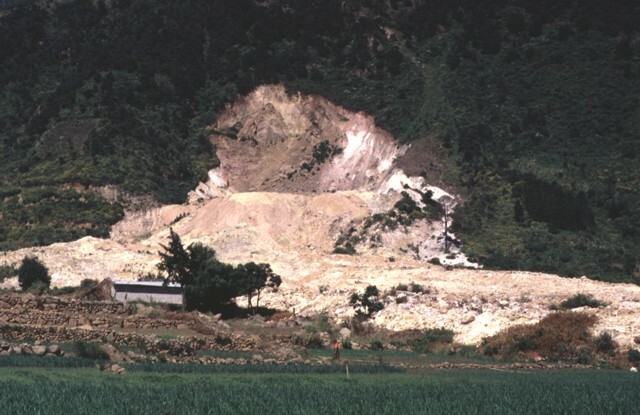 While the long axes of the largest boulders transported by the landslide were 2-4.5 m, boulders had average diameters of 0.4 m in the first flow, and 0.58 m in the second flow. The first flow had a less-prominent levee (about 1 m high) than the second (2-3 m high). In many places, deposit surfaces and the ground nearby were partially covered by fine material that appeared to have been laterally "sprayed" over the surfaces, apparently by the landslide itself. The landslide covered an area [>800 m long and 200-300 m wide, with a combined thickness of 3-10 m]. [Calculations by Flynn and others (1991) indicated a slide volume of about 800,000 m3.] The vertical distance between the top of the scarp, 80 m high and 60 m wide, and the distal toe of the landslide was about 250 m. [Topographic releif in the vicinity of the slide is extreme; measured slope angles range from 30 to 50°.] On 7 January, an additional landslide was caused by the collapse of a 50-m-tall andesitic lava column that detached from the landslide scarp. A cone of loose material that surrounds the well appeared to have been constructed when landslide debris around the well was thrown out by escaping steam. The cone was about 15 m across, and 10 m high, with steam emerging through a 5-m-diameter crater at the top, carrying particulate matter to 10-20 m height on 7 January. An earlier such cone collapsed, forming one of the upper 3 landslide lobes. Andrés Caicedo reported that the steam discharge was considerably less than when the well was previously flow-tested, possibly suggesting that the wellhead was damaged but intact. Reports vary on the presence of precursor activity. [There was no record of rain before or during the slide.] Luis Mérida reported that new ground cracks appeared near ZCQ-4 about 1 week prior to the landslide and Mérida recommended evacuating the area. However, no earthquakes were reported. ZCQ-4 was drilled in 1981 to 1,026 m total depth. . . . The maximum measured reservoir temperature was [260°C]. Further Reference. Adams, M.C., Mink, L., Moore, J., White, L., and Caicedo Anchissi, A., 1990, Geochemistry and hydrology of the Zunil Geothermal System, Guatemala: Geothermal Resources Council Transactions, v. 14, Part II, p. 837-844. Flynn, T., Goff, F., and others, 1991, [title unknown]: Geothermal Resources Council Transactions, v. 15, p. 425-433. Schaefer, S., and Williams, S., 1991, [title unknown]: Geotimes, May 1991, p. 20-22. The Global Volcanism Program has no Weekly Reports available for Almolonga. 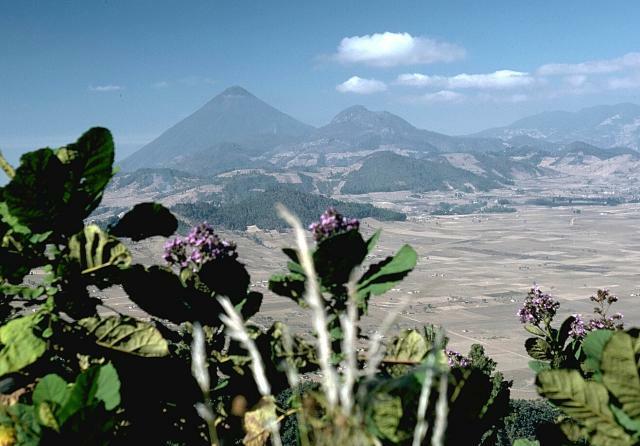 Volcán de Almolonga is an andesitic stratovolcano with a 3.3-km-wide late-Pleistocene central caldera that is located along the Zunil fault zone. The caldera is surrounded by a ring-dike configuration of dacitic and rhyolitic lava domes. The youngest and only historically active dome complex is Cerro Quemado (whose name means Burned Peak), located immediately south of Guatemala's second largest city, Quezaltenango. 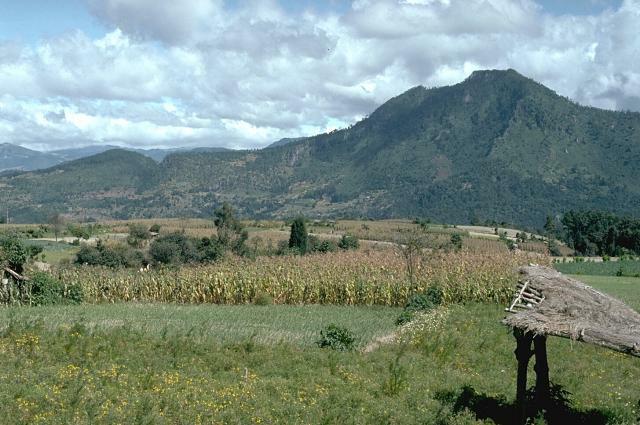 About 1200 radiocarbon years ago, part of the andesitic-to-dacitic Cerro Quemado dome collapsed, producing a debris avalanche and an associated lateral explosion that swept across the valley to the west as far as the flanks of Siete Orejas volcano. The latest eruption in 1818 produced a blocky 2.5-km-long lava flow. Hot springs are located on the northern and eastern flanks of Cerro Quemado, and the Zuníl geothermal field, the site of a geothermal exploration project, lies on the SE flank of Cerro Quemado. Adams M C, Mink L L, Moore J N, White L D, Caicedo A A, 1990. Geochemistry and hydrology of the Zunil geothermal system, Guatemala. Trans Geotherm Resour Council, 14(1-2): 837-844. Flynn T, Goff F, Van Eeckhout E, Goff S, Ballinger J, Suyama J, 1991. Catastrophic landslide at Zunil I geothermal field, Guatemala. Bull Geotherm Resour Council, 15: 425-433. Gall F, 1966. Cerro Quemado Volcan de Quezaltenango. Guatemala: Ministerio De Educacion, 115 p.
Lima Lobato E M, Palma J, Roldan Manzo A R, 2003. Geothermal Guatemala. Past, present, and future development of geothermal energy in Guatemala. Bull Geotherm Resour Council, 32: 117-121. Newhall C G, 1987. Geology of the Lake Atitlan region, western Guatemala. J. Volcanol. Geotherm. Res., 33: 23-55. Sapper K, 1925. The Volcanoes of Central America. Halle: Verlag Max Niemeyer, 144 p.
Siebert L, Alvarado G E, Vallance J W, van Wyk de Vries B, 2006. 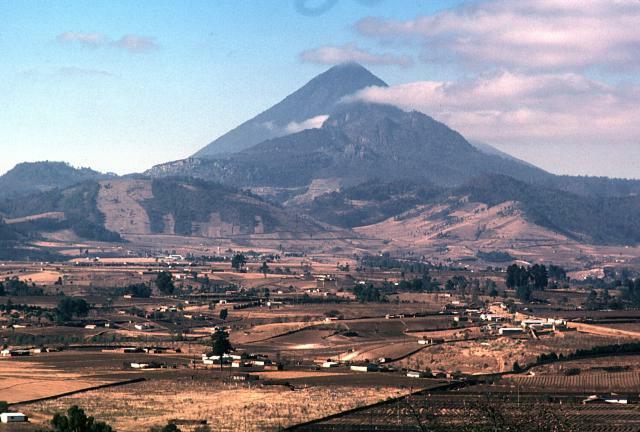 Large-volume volcanic edifice failures in Central America and associated hazards. In: Rose W I, Bluth G J S, Carr M J, Ewert J W, Patino L C, Vallance J W (eds), Volcanic hazards in Central America, Geol Soc Amer Spec Pap, 412: 1-26. Vallance J W, Siebert L, Rose W I, Giron J R, Banks N G, 1995. Edifice collapse and related hazards in Guatemala. J. Volcanol. Geotherm. Res., 66: 337-355. There is data available for 6 Holocene eruptive periods. There is no Deformation History data available for Almolonga. There is no Emissions History data available for Almolonga. The rounded hills in the middle of the photo are part of a chain of lava domes of the Almolonga volcanic field. Collapse of Almolonga stratovolcano sometime prior to 85,000 years ago formed a 3.3-km-wide caldera that is surrounded by a ring-dike configuration of dacitic and rhyolitic lava domes, seen here from the east. 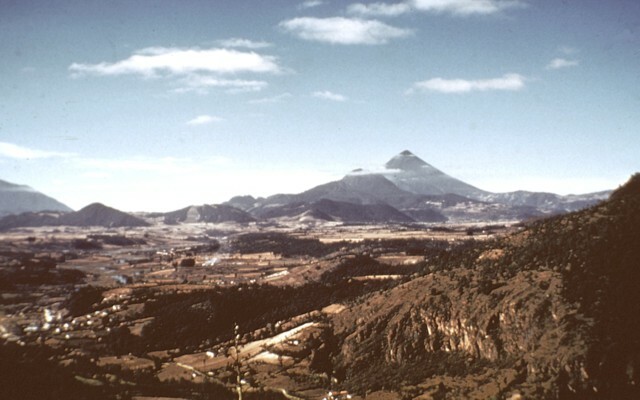 The youngest and only historically active dome complex is Cerro Quemado, on the right-center skyline, right of conical Santa María stratovolcano. The latest eruption of Cerro Quemado in 1818 produced a blocky 2.5-km-long lava flow on its east flank. Photo by Lee Siebert, 1988 (Smithsonian Institution). Cerro Quemado, seen here across the Llano del Pinal plain to its east, is the youngest lava dome complex of Volcán de Almolonga. Collapse of the NE flank of Cerro Quemado about 1150 years ago produced a debris-avalanche deposit that forms the undulating slopes in the foreground. The avalanche scarp is the area in partial shadow below and to the left of the summit. An associated lateral explosion also swept across the Llano del Pinal. The eruption concluded with the emplacement of a small lava dome inside the avalanche scarp. Photo by Lee Siebert, 1993 (Smithsonian Institution). Cerro Quemado, seen here from the SW, is the youngest lava-dome complex of Volcán de Almolonga. 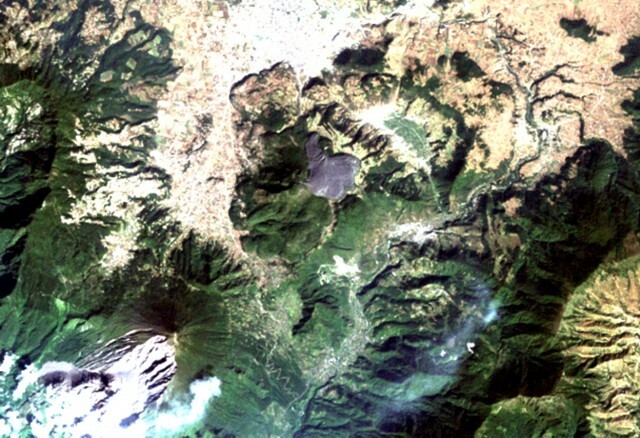 Cerro Quemado is located immediately south of Guatemala's second largest city, Quezaltenango, the outskirts of which are visible at the upper left. The dome complex consists of a series of biotite-bearing andesitic-to-dacitic lava domes and flows. About 1150 radiocarbon years ago, part of Cerro Quemado collapsed, producing a debris avalanche and an associated lateral explosion that swept across the Llano del Pinal, the plain at the lower left. A group of volcanologists standing on the surface of a debris-avalanche deposit produced by collapse of the NE flank of Cerro Quemado about 1150 years ago examine the avalanche source in the background to the SW. The avalanche scarp, which fills all but the extreme right-hand slope of this view, is 1 x 1.5 km wide. An associated lateral explosion also swept across a 40 sq km area NE of Cerro Quemado. The eruption concluded with the emplacement of a small lava dome near the headwall of the avalanche scarp. A cloud nestles around the summit of Cerro Quemado (right-center), with the towering conical peak of Santa María volcano directly behind it. The latest eruption of Cerro Quemado, the youngest lava-dome complex of Almolonga volcano, took place in 1818. A blocky lava flow, which forms the left-hand ridge of Cerro Quemado in this view from the NE, was erupted from the east-central flank and traveled 2.5 km towards the towns of Zunil and Almolonga. Minor explosive eruptions that accompanied the extrusion blanketed nearby hills with ash. 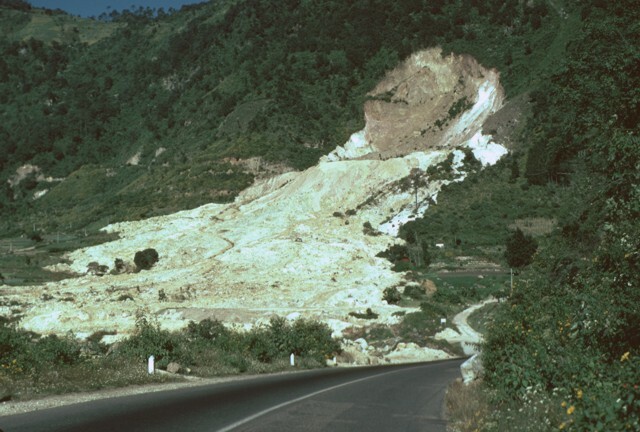 The light-colored area in the foreground is the trace of a landslide from the Zunil geothermal field that occurred on January 5, 1991. The landslide traveled 800 m from its source along the Zunil fault zone toward the Río Samalá and killed 23 people living in small farms on the valley floor. Some of the survivors of the slide were treated for burns from the hot flow, which cut the highway between Quetzaltenango and the Pacific coast. This view looks along the Río Samalá valley to the NE with the flanks of Cerro Quemado volcano in the left background. Photo by Carlos Pullinger, 1993 (Servicio Nacional de Estudios Territoriales, El Salvador). The source area of the January 5, 1991 landslide at the Zunil geothermal field exposes the trace of the Zunil fault zone, which runs parallel to the Río Samalá valley. 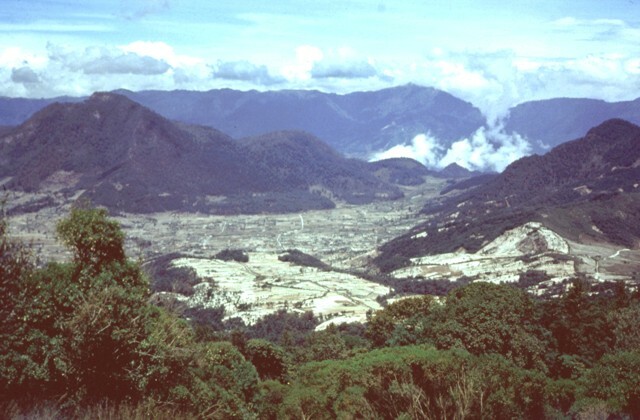 The flat area below the landslide source area in this view from the SE is the site of the Zunil 1 geothermal project. The slide damaged and buried the geothermal well ZCQ-4. A small crater formed when debris that buried the well was ejected by hot water and steam that escaped from the damaged well. The line of low forested lava domes in the center of the photo marks a chain of domes erupted along the rim of the Pleistocene caldera of the Almolonga volcanic field. The highest dome, Cerro Quemado, is the peak seen here from the north with a cloud-draped summit. It lies below and to the left of Santa María volcano, the sharp-topped peak at the right-center. Almolonga stratovolcano collapsed to form a 3.3-km-wide caldera sometime prior to 85,000 years ago. Post-caldera eruptions produced eight andesitic-to-dacitic lava domes. Photo by Bill Rose, 1973 (Michigan Technological University). 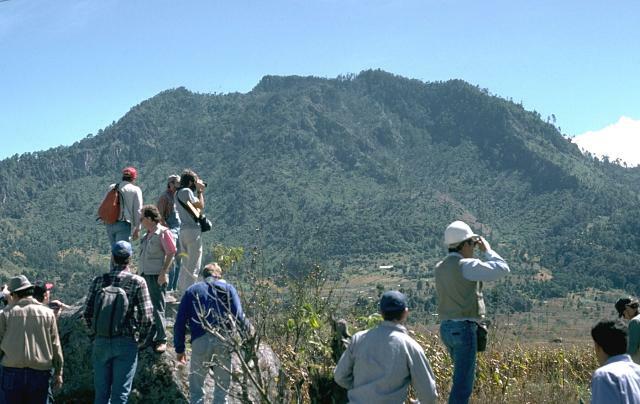 The forested Cerro Quemado lava dome (left), seen here from Siete Orejas volcano, is one of a series of dacitic and rhyolitic lava domes constructed along the margin of the Almolonga caldera. The central dome complex of Cerro Quemado was erupted during the Holocene from at least 8 vents arranged in a circular pattern. One of these flank vents forms the low rounded ridge below the center horizon. Santa María volcano lies just out of view to the right, and the western side of the Santo Tomás (Pecul) volcanic complex forms the horizon. Photo by Bill Rose, 1975 (Michigan Technological University). Collapse of the NE flank of Cerro Quemado about 1150 years ago produced a debris avalanche that forms the hummocky terrain in the foreground. The avalanche scarp is the area in partial shadow below the summit. An associated lateral explosion also swept across the Llano del Pinal, the plain in the foreground. The eruption concluded with the emplacement of a small lava dome inside the avalanche scarp. Photo by Bill Rose, 1989 (Michigan Technological University). Blocky lava spines bristle along the summit ridge of Cerro Quemado volcano, the youngest of a series of andesitic and dacitic domes erupted along the margins of Almolonga volcano. The early stages of the Cerro Quemado complex produced a sequence of lava flows and domes erupted from at least eight vents. During the later stages, about 1150 years ago, the summit dome of Cerro Quemado was emplaced following failure of the summit of the complex. The only historical eruption took place from an east-flank vent in 1818. Photo by Bill Rose, 1972 (Michigan Technological University). 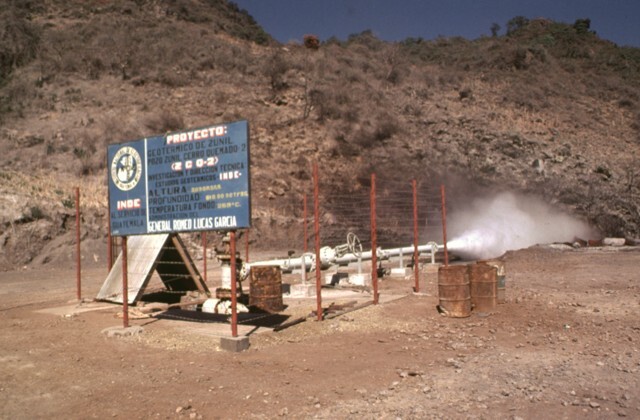 The Zunil geothermal project is seen here in 1981, a decade prior to a landslide that buried the well site. Well ZCQ-4 was drilled in 1981 to a depth of about 1300 m and cemented to a depth of 400 m. In October 1989 the recorded bottom hole temperature was 260 degrees Centigrade. The upper part of the Zunil geothermal system contains acid-sulfate hot springs. Associated mudpots and fumaroles occur at high points on both sides of the Río Samalá, and bicarbonate-rich hot springs discharge into the river's canyon. Photo by Bill Rose, 1981 (Michigan Technological University). Bedrock in the area of the Zunil geothermal field on the SE flank of Cerro Quemado volcano is extensively hydrothermally altered. The geothermal area is located along the Zunil fault zone, which juxtaposes brownish-red weathered to lightly altered andesitic-dacitic lava flows with white-to-pink heavily altered and brecciated volcanic rock. Hydrothermal alteration minerals include kaolinite, pyrite, gypsum, and alunite. The NE-SW-trending left-lateral fault zone runs parallel to the valley of the Río Samalá. 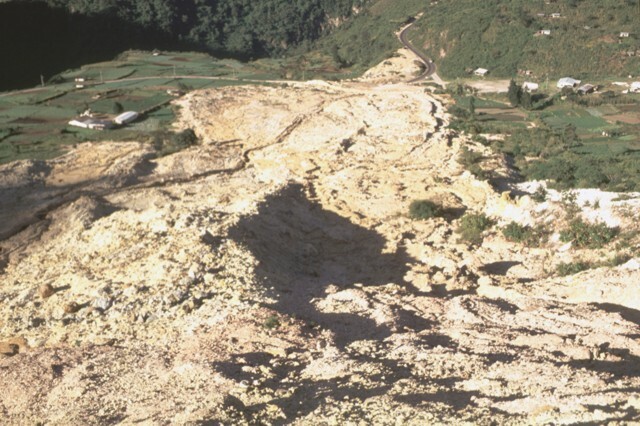 The 80-m-high headwall scarp of the January 5, 1991 landslide at the Zunil geothermal field is the beige-colored area that exposes the trace of the regional Zunil fault zone. 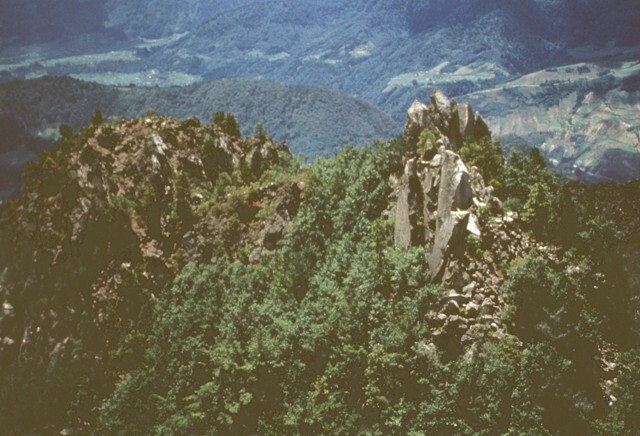 The light-colored avalanche deposit extends about 800 m from the source and cut the highway between Quetzaltenango and the town of Retalhuleu on the Pacific coastal plain. The avalanche destroyed a church and more than a half dozen houses, killing 23 people. The elevation difference from the head of the scarp to the distal end of the deposit was 250 m.
This view looks down the travel path of the January 5, 1991 landslide at the Zunil geothermal site. The avalanche of extensively hydrothermally altered material along the Zunil fault zone traveled 800 m from its source. The slide reached nearly to the Río Samala and can be seen at the top of the photo cutting the highway between Quetzaltenango and Retalhuleu. 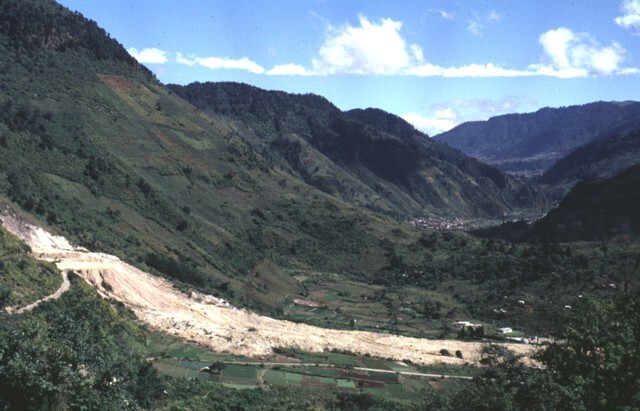 The landslide consisted of four overlapping lobes with a combined thickness of only 2-3 m.
Photo by Claus Siebe, (Universidad Nacional Autónoma de México). Santa María volcano, located south of the city Quetzaltenango, the second largest in Guatemala, is one of the country's most active volcanoes. Santiaguito lava dome was constructed within a large crater formed during the 1902 eruption of Santa María. 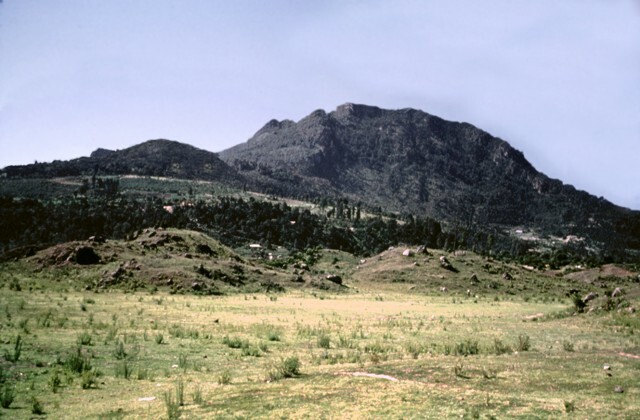 The unvegetated lava flow above and to the right of Santa María was erupted from Cerro Quemado volcano, part of the Almolonga volcanic complex, which also includes the series of lava domes to the north of Cerro Quemado. 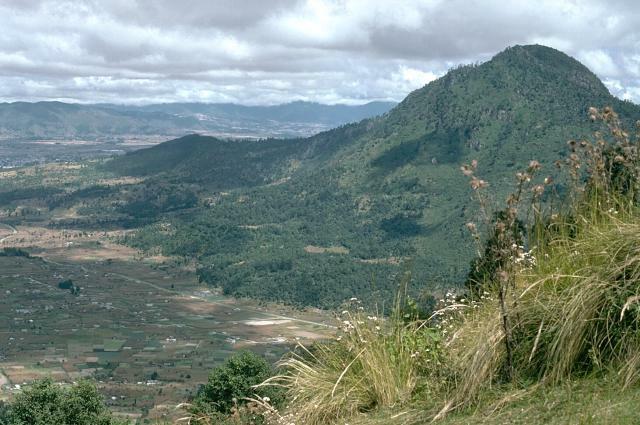 The large forested depression at the left is cut into Siete Orejas volcano. NASA Space Shuttle image ISS004-E-7999, 2002 (http://eol.jsc.nasa.gov/). The arcuate area at the top center below the light-colored city of Quetzaltenango is the Almolonga volcanic complex. An arcuate series of lava domes outlines the northern part of the complex, while the unvegetated area to the south is the 1818 lava flow from Cerro Quemado volcano, the youngest of the Almolonga complex. Almolonga is located along the Zunil fault zone, which extends diagonally SW along the Río Samalá (bottom-center). 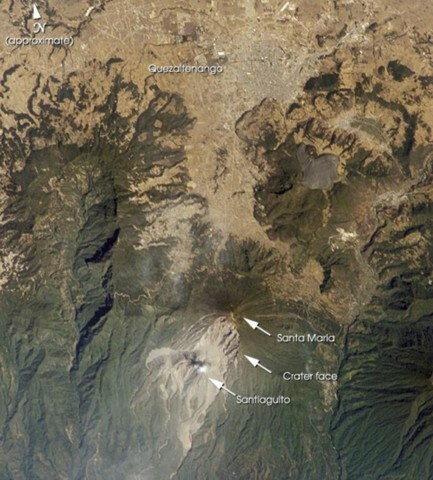 The furrowed 1902 crater of Santa María volcano lies at the lower left. NASA Landsat image, 2000 (courtesy of Loren Siebert, University of Akron). There are no samples for Almolonga in the Smithsonian's NMNH Department of Mineral Sciences Rock and Ore collection. Large Eruptions of Almolonga Information about large Quaternary eruptions (VEI >= 4) is cataloged in the Large Magnitude Explosive Volcanic Eruptions (LaMEVE) database of the Volcano Global Risk Identification and Analysis Project (VOGRIPA).